Sometimes exploration of new ideas and new technologies leads to dark places. In Star Trek, we’ve seen many a cautionary tale about omniscient supercomputers, time travel, genetic manipulation, and telepathic oppression. The pursuit of knowledge isn’t always safe or pretty. Hearts and Minds is a mini-mission that explores the consequences of some unconventional research gone awry. This mission is a “story in one act,” so you can easily finish it in a quick play session, and it’s easy to complete it with any additional characters that you may have on your account – which is handy, because the mission offers a special reward. Since Hearts and Minds is a horror story, it will only be around for Friday the 13th, whenever that may fall on the calendar – and perhaps another sufficiently horrifying day that we might choose! Fortunately for the squeamish, Hearts and Minds is creepy, but not graphically gruesome. After all, what you can imagine is sometimes more horrific than anything you can be shown. 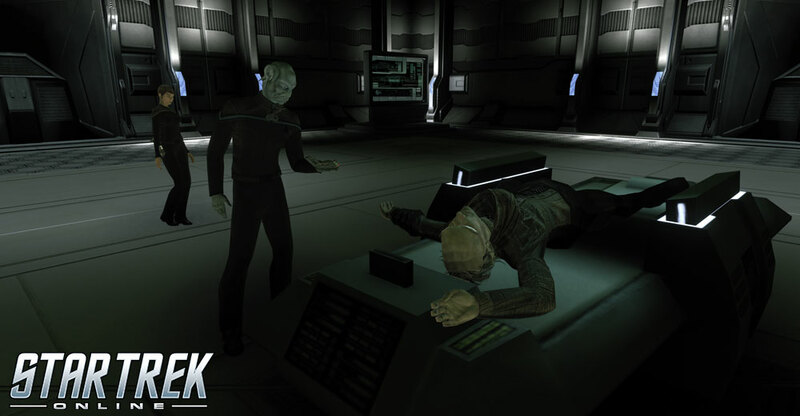 Hearts and Minds takes place in the Donatu sector of the Eta Eridani sector block, at a lunar research station in the Donatu system and characters level 11+ can accept this mission. Hail Franklin Drake (Federation officers and Romulans allied with the Federation) or K’Men (Klingon officers and Romulans allied with the KDF) to undertake this mission. It is available to play from around 6pm PT July 12th until around 6am PT July 14th. NOTE: If you have completed the mission before, you will be able to acquire and complete it again to earn another copy of the reward.